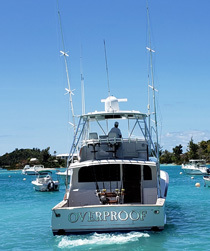 OVERPROOF is a 2005 42 foot Wilson Boatworks, Custom Carolina vessel. OVERPROOF is fast, powered by twin 480 Cummins and she handles the seas well. There is a comfortable seating and dining area in the salon with an open back that allows you to be part of the action in the cockpit. The cockpits is wide with a 14.5foot beam and a Bluewater Yachts fighting chair and two very large under deck fish boxes. The cabin is air-conditioned and has two comfortable berths and bathroom facilities. 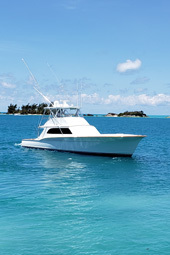 Because of her speed, we can get you out to the fishing grounds in less than a 1/2 hour so that you can have maximum fishing time. 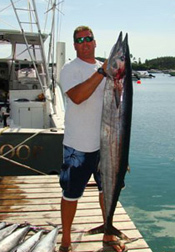 In addition to her experienced Captain, the other advantage you will have over the fish is the latest in deep sea fishing electronics and top shelf tournament tackle – we use Alutecnos and Shimano Tiagra reels. You will fish in comfort and style on the OVERPROOF.